Harvard Army Air Field, located two miles northeast, was one of eleven army air forces training fields in Nebraska during World War II. The 1,759-acre base included runways, hangars, barracks, and fuel and munitions storage. Construction began in September 1942, and the airfield was activated in December. The coming of several thousand military personnel and civilian workers caused an acute housing shortage and stressed other local services. 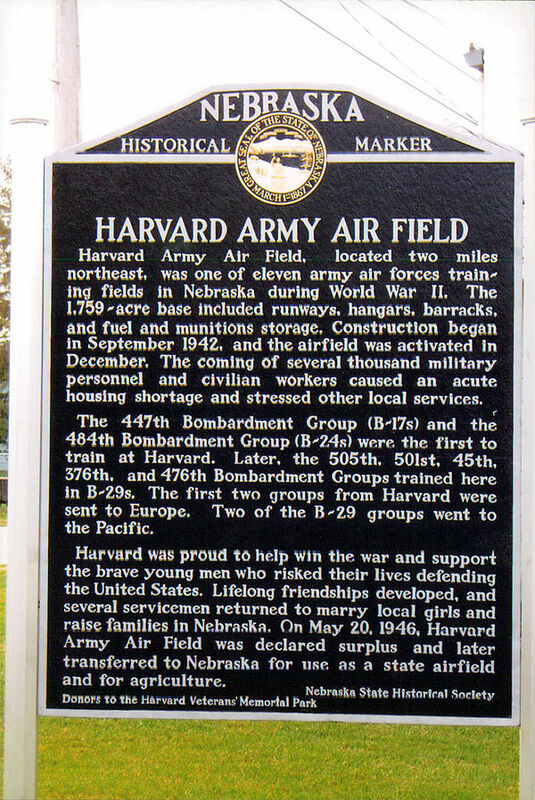 The 447th Bombardment Group (B-17s) and the 484th Bombardment Group (B-24s) were the first to train at Harvard. Later, the 505th, 501st, 45th, 376th, and 476th Bombardment Groups trained here in B-29s. The first two groups from Harvard were sent to Europe. Two of the B-29 groups went to the Pacific. Harvard was proud to help win the war and support the brave young men who risked their lives defending the United States. Lifelong friendships developed, and several servicemen returned to marry local girls and raise families in Nebraska. On May 20, 1946, Harvard Army Air Field was declared surplus and later transferred to Nebraska for use as a state airfield and for agriculture. On September 17, 1942, construction began on the 1,704-acre Harvard Army Airfield located three miles northeast of Harvard, Nebraska. After making farmers vacate their properties, construction was largely completed by November. Personnel began to arrive in December. The field was used as a training ground for bomber pilots of the Second Air Force. Planes in use at the field included B-17s, B-24s and B-29s. Twenty-six squadrons received proficiency training while at Harvard. Originally a satellite base for the Kearny AAF, Harvard eventually became its own operation. It saw continued use after the war as a training facility until 1946, when it was declared surplus. It was handed over to the Nebraska Department of Aeronautics who in turn leased the land to farmers. Three of its hangars were destroyed in 1983 by a fire caused by teenagers trying to salvage parts of the hangars. Of the 277 buildings constructed for the field, only 7 now remain. Three planes originating from Harvard were involved in fatal air crashes, resulting in 14 deaths. Goeres, Vince. Wings Over Nebraska: Historic Aviation Photographs. Lincoln: Nebraska State Historical Society Books. 2010. Kooiman, Barbara M. Aviation Development in Nebraska. Nebraska State Historical Society State Preservation Office and Nebraska Department of Aeronautics. Mississippi Valley Archaeology Center at University of Wisconsin-La Crosse. 2000. Penry, Jerry. Nebraska’s Fatal Air Crashes of WWII. Milford: Blue Mound Press. 2009.